Hi, here is my next scenario. After steppe map I wanted to create more insular, forested world. 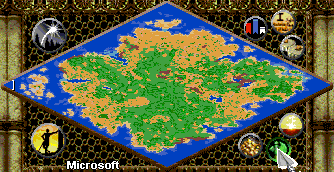 This map is mixture of arid plains, humid forests, savannah, mangroves and deserts without any settlement. Nothing prevents you from completing the own towns and villages according to their imagination. One each of the eight player starts with randomly located Town Center and 3 Villagers. Seven computers have The Horde AI (originally made by Zergs) and they are free for all.